Hands-on with this long-in-the-making 3D adventure game. In State of Mind, the world is split between a dystopian reality and a utopian digital alternative. In 2048 Berlin, journalist Richard Nolan criticises the move towards mass surveillance and automation, where a powerful network remembers details like which illnesses and conditions you have so it can treat you. After Nolan and his family are caught in a suspicious accident, he finds himself at the centre of a conspiracy. The digital world, meanwhile, is simulated based on all this information harvested about real people. Mass surveillance and transhumanism are far from new themes in popular fiction, but it's the presentation of the split between these two worlds that's intriguing about State of Mind. Real world Berlin looks like a Blade Runner riff—bright lights and slightly grimy. The sequences based inside the digital world, meanwhile, are shinier and cleaner. In State of Mind, you alternate between six different characters as the conspiracy unravels, though about 60 percent of the story is focused on Richard. 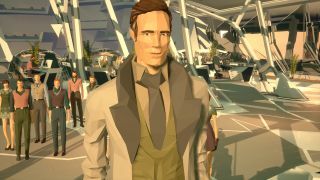 State of Mind is a contemporary point-and-click game above anything else—you navigate 3D environments figuring out how to reach the next area. In my demo, that involves mixing chemicals in a syringe to knock out a doctor and take his keycard, based on post-it notes around the environment that hint at the correct ingredients. Another puzzle has you constructing a shock device so Richard can reach through a vent and jab a security robot with it, allowing him to reach a room with a switch that opens a nearby door. Some of the puzzles don't do it for me—placing pieces of cover in front of security cameras so you can avoid their vision cones, for example, feels very old school. But one type that repeats several times does appeal: you slide tiles from different environments together to form an image of a single place, and then you're transported to one of Richard's memories set in that location. It's an impressive effect. In the demo, the other character I try is a guy called Adam, who's voiced by Doug Cockle of Geralt fame. Adam is based in the digital world, and he and Richard share some odd connections: they have near-identical memories of an accident involving a car crash, for example, and their lifestyles seem pretty similar. Adam's trying to piece together why using a pinboard in his apartment. The art style is a much better fit for the environments than the characters. The low poly models are expressive enough that I understand them in cutscenes, but a flatter design would've been easier on the eye. You do get used to them, though, and the colour palette's split across the two worlds is effective. My favourite moments in State of Mind involve more subdued situations, like a helper robot asking if she can sit and listen to music with Adam in his apartment, which is a nice little bit of characterisation. You can interact with the art on the walls in the game and they'll pop out as a 3D display, which looks cool. In one section, Adam has the option to change the colour of sky in his virtual world, and to play music in different parts of the environment. These details make it feel like the developers have taken world-building seriously. The story itself is so dense that it's actually tricky to parse in demo form, but I'm curious to see how deeply State of Mind will explore its themes—and whether it'll have anything new to say about them. State of Mind is out on 16 August.